People have dried meat to preserve it for thousands of years. The practice seems to have arisen independently in both South America and Africa, with the two traditions cross-pollinating with the Spanish conquests of the Americas. The Native Americans eventually adopted the Spanish word for their dried meat, ‘charque‘, changed the inflection and morphed it into the word ‘jerky’. Jerky was borne out of necessity. The vast spaces across the continents meant that travellers had to have a reliable way of preserving meat without refrigeration, and drying provided just that. 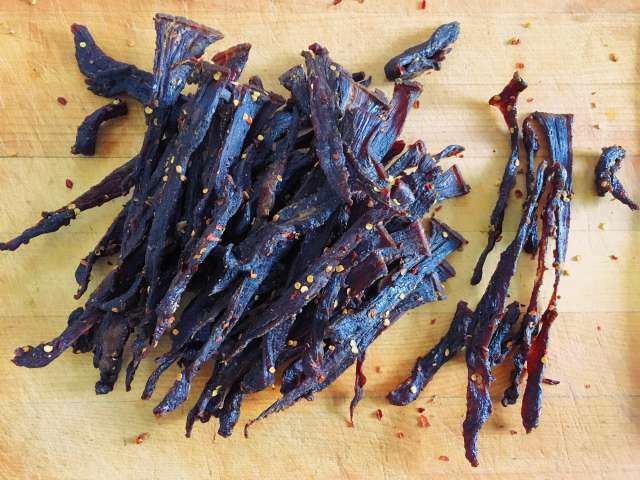 Jerky is light, portable and nutritious, packed with protein, and it lasts for months in good condition. 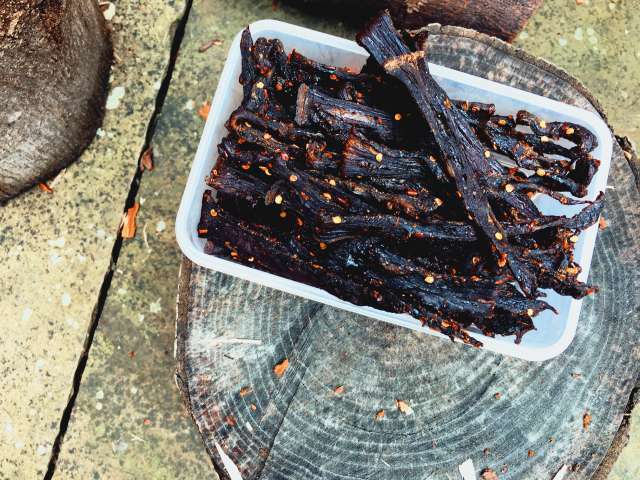 Today, jerky is still synonymous with the Americas, both north and south. It’s still a popular snack, and the flavour combinations are vast. It’s also very straightforward to make, simply a matter of flavouring and then gently dehydrating strips of meat, most likely beef, but goat, or even buffalo or kangaroo work well, too. The cut of meat is important. I used skirt, as it’s full of flavour and comes as a relatively thin slab of lean meat. Skirt is from the belly of the cow, a part of the cut known as the plate, which sits between the brisket and flank. It isn’t used much these days, which is a real shame, because it’s tasty, cheap and stands up well to long, slow cooking – perfect for the slow cooker. To tenderise skirt, it’s normally cut across the grain, but that’s not the case here. Rather counter-intuitively, the idea is to make the meat chewy, for that’s exactly what jerky needs to be. To do this, cut the meat along the grain, not across it, into thin, three or four millimetre strips. There’s a trick to this. It isn’t easy to do on a piece of meat at room temperature, so the best thing to do is to lay about a kilo of skirt beef in one piece on a tray and put it in the freezer for half an hour. The meat will start to freeze, and will be much more manageable under the blade of a large knife. Once sliced, put the beef into a zip-lock plastic bag, and add a marinade made from about 100ml of Worcestershire sauce, two tablespoons of crushed garlic, two tablespoons of red chilli flakes, a tablespoon of ground black pepper and three teaspoons of honey. The skirt needs to sit in the marinade for a day. Turn it over every so often, so that the marinade reaches all parts of the meat evenly. Drying the meat is easy, it just takes time. You could use a custom-built drying chamber made of a plastic box, a fan cannibalised from an old computer for airflow and an old-fashioned light bulb as a heat source, but that requires some thought, planning, tools, and Google. Better to just use an oven, which come complete with absolutely perfect drying racks. Lay each strip of meat across the rungs of one of the oven’s racks, and let it hang down. One rack is big enough to hang at least a kilo of jerky from. Place a tray underneath, on the bottom of the oven to catch drips. Set the oven to its lowest setting. I use the fan function to make sure that the air flows around the jerky evenly, and I also prop the oven door open a crack with a wooden spoon to further reduce the heat. The idea is to dry the meat, not cook it, so it’s important that the temperature is kept low and stable. 50c is quite hot enough. The jerky will take four or five hours to dry in this environment. Check it every half an hour to make sure it isn’t catching in the heat. It’s ready when it’s hard and visibly dry. Use your judgement. Jerky can be stored at room temperature, in a jar or other airtight container, for a month, for six months in the fridge, or for a year in the freezer, although I don’t think any of mine has ever actually survived uneaten for more than a month. The Wooden Chopping Board Co.